If It's Too Loud...: Walter Sickert & The Army of Broken Toys - "Come Black Magic"
Walter Sickert & The Army of Broken Toys - "Come Black Magic"
Walter Sickert & The Army of Broken Toys released their new single "Come Black Magic" about 20 years too late. The mid 90s were this magical time where your favorite weirdo band could have a breakthrough single. "Come Black Magic" would have been the perfect single for this. It's just heavy enough for the metal kids to get into, but odd enough for the alternative/college radio crowd to enjoy. There's also actual guitar solos! (Don't worry, you'll still get some killer viola solos. This still is Walter Sickert & The Army of Broken Toys, after all...) Plus, the addition of Mary Widow singing backing vocals and harmony adds this crazy layer to the band, and just pulls you into the song even further than before. 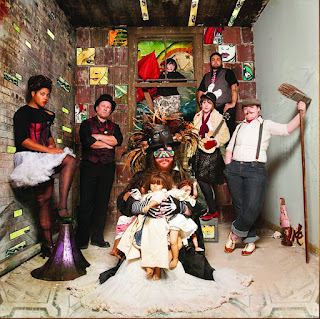 "Come Black Magic" is Walter Sickert & The Army of Broken Toys' guaranteed hit single. If this had existed in the 90s, there would have been a screwed up video for it that would have started on 120 Minutes, then been a guaranteed Buzz Bin video, and radio airplay on the modern rock stations. Unfortunately, this is 2016 and none of that exists anymore. You can listen to "Come Black Magic" below. The album Come Black Magic will be released tomorrow, September 9. You can get your copy over at Bandcamp. If you happen to be in the Boston area that day, make sure you head out to the album release show at The Sinclair in Cambridge. It's almost guaranteed to be the event of the year.